Humble Bundle has teamed up with Nintendo to offer games in exchange for however much you want to pay! There are currently 8 games available, valued at a total of $179. You can decide to pay as little as $1 and you will be able to get the download codes for three Nintendo games, which you can redeem through the eShop for your Nintendo Wii U and/or Nintendo 3DS. Nintendo collaborated with Humble Bundle before, but their offer was region locked to North America only. This time, Europe gets a share in the deal! 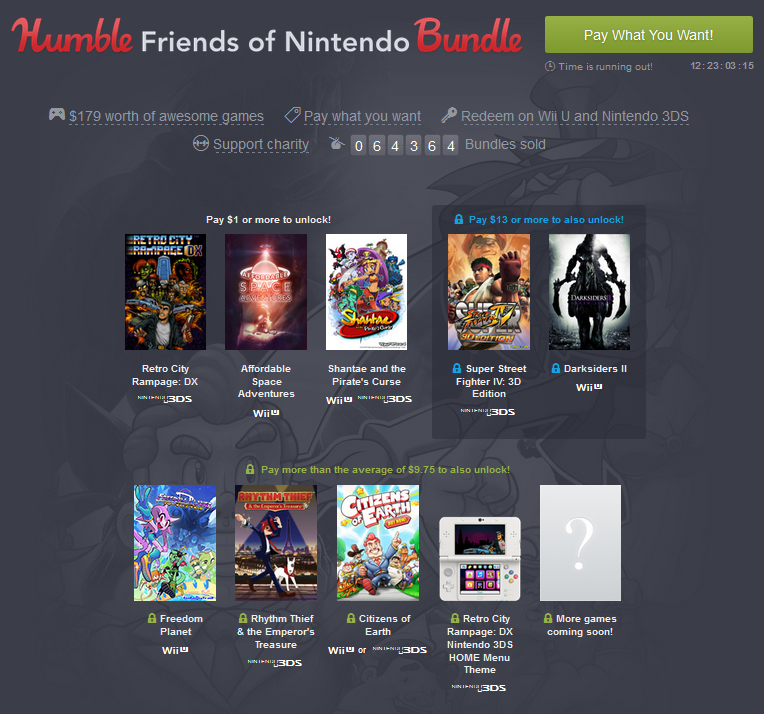 Purchase the Humble Friends of Nintendo Bundle to get a selection of Nintendo 3DS games and Wii U games and support charities at the same time. More games will be available from Tuesday, May 3rd 2016. Anyone who pays more than the average price will automatically receive the additional games once they are revealed. How does Humble Bundle work? New to Humble Bundle? Don’t worry – it’s not complicated at all! Once you’re logged in, decide how much you want to pay and scroll down to the payment area. If you want to pay only one dollar, just click on ‘custom amount’ and enter the amount you wish to pay. Next, you can decide how to split your money between the game developers, charity and Humble Bundle. There is a default split set whereby 65% goes to the developers, 20% to charity and 15% to Humble Bundle. When you enter your e-mail address, use the same e-mail address as the one you used to register yourself with on Humble Bundle. You can now proceed to pay by credit card, PayPal, Amazon or Bitcoin. It’s really that simple. Enjoy your Nintendo games!